Araby Worth spends her life trying to forget the loss of her twin brother, the preoccupation of her parents, and most of all, trying to forget herself. Together with her friend April, she dresses up, avoids the plague-ridden areas of the crumbling city as much as possible, and does whatever it takes to find oblivion. She doesn't think she deserves happiness. She barely believes she deserves to live, until she gets close to Will, the proprietor of the club she visits. And until she is thrust into the middle of intrigue, deception, and a plot against the leader who long ago condemned most of his people to a horrific death. Now, Araby must choose sides in a landscape of shifting alliances, uncover secrets that change everything, and keep those she loves alive while death is merely a breath away. MASQUE OF THE RED DEATH is a haunting, atomspheric story full of despair, flashes of hope, and proof that the human spirit is resilient, even when all seems lost. The world of the story, with its crumbling city, masks, class divisions, and cruel leader will stay with readers long after they close the book. The characters are flawed and complicated, and their moments of hope are hard won. I enjoyed the romance, and I loved seeing Araby learn how to live instead of merely survive. This is a lovely debut from Ms. Griffin, and I look forward to reading more from her. As an avid lover of the Edgar Allen Poe's work, I was a little leery about reading this book. I was almost afraid to read it out of fear I would hate it, but in the end, my curiosity won out and I bit the bullet, and I must say I am so glad that I did. It was a very entertaining read. I found the world to be the most intriguing part of this book. It had an interesting mix of futuristic, dystopian, and historical elements which gave it a steampunk feel that I rather enjoyed. I particularly enjoyed the historical elements because it helped tie into Poe's original story. The author also did a good job of world-building; not too much not too little. And it seems that what wasn't answered in this book is going to be answered in the next one. One aspect of the book that I really liked was how well the author touched on the disparity in the treatment of the rich and the poor. The author was not afraid to show the harsh lives of the poor and did not sugar coat their maltreatment. While, not a negative to the book, I do wish that the author would have gone into a little more depth about the masks. I really would like to understand more about the mechanics of the masks, not just how they look and that their function is to keep them from getting the weeping sickness. The thing I loved most about this book was the love interests, yes it had a love triangle and I actually liked it. I normally hate love triangles, as I find them overdone and cheesy, however, this book is a circumstance of a love triangle being done right. Both of the love interests were likable but not perfect and it wasn't obvious as to who she is going to choose, and it was not the forefront of the book but was more of a subplot. I do feel that it's important to caution some readers about themes within the novel. There is quite a bit of recreational drug use as well as themes of abuse, torture, general violence, and neglect. I personally do not mind these themes as they fit well into the story and give the story more depth, however, these themes may make the novel unsuitable for some readers. Wow! This was a really good story! Like the whole contagion idea. Waiting for the 2nd book now! Love the whole steampunk feel!!!! Masque of the Red Death by Bethany Griffin is a little hard to put into words. It's a dark and intense book with contagions and Victorian times and slightly steampunkish and gothic themes. Basically - Masque of the Red Death isn't a book that's usually something I'm into. So if you're kind of like me and not really into that stuff - you should read Masque of the Red Death anyway. I'm sure you just did a double-take. I KNOW. I did too. Because guys, Masque of the Red Death was so captivating and almost impossible to put down. I mean, it took me like 50 pages or so to really get into it, but once I was there, I was all there. Because there are SO MANY SECRETS and twists that are just dropped left and right in Masque of the Red Death, and I didn't in a million years expect them. All those new twists that kept getting dropped made me go WHAT and sucked me further into the story. I loved the character in Masque of the Red Death, too. I loved Araby and I freaking loved Will (no matter what anyone says), and even April. My thoughts are mixed on Elliot, but we'll see in the next book. Which needs to get in my hands, ASAP, by the way. I'm very curious to see where everyone's allegiances lie in regards to the love triangle. Let me know! And the writing was STUNNING. Bethany Griffin put together these simple sentences but managed to make them very descriptive and telling, and I just loved it. 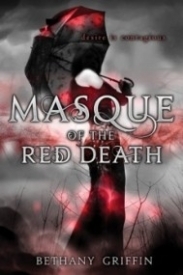 Even if the dark, Gothicy, steampunkish, plaguey, rebellion thing doesn't really do it for you, definitely give Masque of the Red Death by Bethany Griffin a shot. You'll throw your usual books out the window for this one, I promise. When all is said and done (or read, as it may be) I’m just not really a fan of Masque of the Red Death. I don’t generally like to debate the merits of love triangles since I find the general hate for them a bit silly, but this happens to be one of the few times I just can’t get on board with it. Now, I understand Araby’s confusion and indecision for the first half of the book. She’s just now exploring this new world of boys who like her and she finds things she likes about both of them. Okay, totally been there. But you know what’s not cool? Desperately wanting to kiss and be with one of them (Will) and instead making out with the other (Elliot). Especially when it seems to me she’s only doing it because he’s the one there at the time. This would be excusable if Araby happened to have loose morals, but she doesn’t so it doesn’t fit with her character at all. Plus, Elliot is an absolutely horrid person. And then there’s the problem of the entire second half. I’m going to be blunt here: it felt like a jumbled mess. Sure, I got the gist of it, but I’m still a little unclear just exactly how they came to arrive at the ending. It felt like there weren’t any transitions to speak of and things just kept randomly jumping from point to point. The Nutshell: In short, I really wasn’t a fan of Masque of the Red Death. The love triangle did not work for me at all and it felt way too all over the place storyline-wise. I’ll probably read the sequel simply to see if Araby comes to her senses and stops kissing the jerk. Grotesque but Beautiful! I loved this book! Very Poe like! I like dark, angry, screwed-up stories. I really do. Looking at the cover, I was a bit worried that it might be like some other historical fiction books that have things such as petty cat-fights, dramatic "It's not you, it's me" breakup scenes, scandalous affairs and the such at its centre instead of the badass stuff. I was definitely not disappointed. The characters definitely didn't freak out if their BFF's shoes don't match their hats or whatever; they were quite down to earth, actually. I love Edgar Allen Poe's works, but haven't read The Masque of the Red Death yet, so I can't make a comment on the connections between the works of the two authors, although Bethany Griffin did a fantastic job with creating a despairing atmosphere of Poe's world. From the beginning to the end, it was all very depressing in a good way. Araby finds nothing to live for and do pretty much nothing except for clubbing with her one and only friend, April. So far so good. To be honest, I genuinely can't put a time era onto this. The plague part of the book may easily be part of the time when the Black Death ravaged Europe, but it could at the same time be something like the flapper era, or the Prohibition. Or it could simply not be on our time, and follow something else entirely. Just my thought. Araby is not a kickass heroine. At first I thought of her as quite weak, without a point in life. She made decisions I couldn't stand, or just did nothing at all. I don't hold it against her. What made me like her wasn't her epic hand-to-hand combat skills, or her charismatic leading of rebelling civilians, but instead her pure, complete sadness and loss. She has a reason for not having anything to live for. A really big reason she just can't forgive herself for, and what she because of that, although quite unhealthy, was a bit noble in a terrible way. She was trying to make amends. I love the pwnage heroines, but Araby has a special spot in my heart. Next is April, BFF to Araby. My first impression of her was simple: airhead. But think about it. She was loyal. She wasn't freaked out by the social recluse in the form of Araby Worth. And as the story went on, I definitely didn't think of her as an airhead. The plot was amazing, and although it didn't have a ton of action scenes, it was very beautifully written, from Araby's memories to the description of the dead/dying in the beaten-down streets. Books are sometimes described as "fast and driving" or "enchanting" or something like that. My idea of it'd be "stepping on eggshells," in a very good way. One false move and anything may fall apart. I'd definitely recommend Masque of the Red Death to just about anyone. Bethany Griffin's Masque of the Red Death is based on Poe's story of the same name. Having not read that, I cannot speak to the quality of this novel as a retelling. What I can assert with confidence is the awesomeness of this book as its own entity. The story contained inside this book perfectly matches the mood of creepiness and beauty set by the cover. A horrible plague swept humanity, killing indiscriminately. There still isn't any cure, although the wealthy, at least, have found a way to protect themselves. Araby's father, a noted scientist, invented the mask which can filter the air and keep out the infection. Now those with money enough to purchase them can live with less fear of the disease. Araby is one of the lucky ones, and she hates it. Her family has money and she is pretty well protected from the plague. None of this means anything to her without her brother, though, who died from the disease because she got the first mask instead of him. Filled with guilt and loneliness, Araby has made a vow never to do anything that her brother Finn didn't get to do. Grief-stricken Araby suffers from intense depression, so deep that she nearly committed suicide. Her savior, April, gives her reason to keep going: escapism. With April, she gains access to the most exclusive club, The Debauchery Club. Within its walls, she can procure drugs or alcohol, forget about life for a while. Plus, she can eye the cute guy who works at the door. These opening chapters do lag a bit, suffering from a poor little rich girl vibe, but the story picks up when April's brother appears on the scene. Like so many books these days, Masque of the Red Death does have a love triangle. Unlike most books, I have absolutely no idea which guy will win fair Araby's heart. In fact, I'm not even certain which guy I ship her with. Both have their moments and their drawbacks. Will seems almost too perfect, beautiful and kind; in a world such as this, I doubt someone could truly stay so pure, and so I imagine there must be some dark secrets there. Elliott, April's brother, definitely has issues, having had some serious family problems. Still, there's something so desperate about how much he clearly needs Araby that holds an appeal. Basically, I am torn, and I will remain undecided until the next book. While the romance aspect does make up an important part of the plot, the world building definitely takes the lead. In this plague-ridden city, three different groups battle for supremacy. Prince Prospero has control at the moment, reigning from his castle, keeping his power through fear and withholding of resources. Two different groups aim to overthrow him, including the creepy as hell Reverend Malcontent. Add to this a totally new disease and it's possible no one will survive this future. Masque of the Red Death is gorgeously written and atmospheric. The internet informs me that I have to wait until April 2013 for the next installment. This does not please me. I was worried there for a moment. I thought that this wonderful book was stand alone. Fortunately that is not the case! It ended with such a great cliff hanger and so many questions left unanswered and problems left unsolved I would have certainly hated it if it were indeed a standalone. As I said, fortunately it isn't. Essentially this book would have easily been five stars if not for one fairly important aspect. The plot. I don't mind a slow moving, atmospheric book, in fact I love it. However, I found the plot somewhat confusing early in the book (this might have been because Araby, our protagonists, was kept in the dark for much of the story) and strangely paced. It felt as if it was moving along nicely, then suddenly stopped for a time and then jumpstarted and plowed through the climax in barely fifty pages. Strange pacing, but overall, not too detracting. The romance renewed my faith in love triangles. At least a little. [SPOILER] I really really really really really hope she ends up with Elliot, it seems like that will be the case in the end, if it happens I will love this romance more than I can describe!!! [SPOILER] Both guys are incredible, but I definitely favor one. And it appears that the author does not favor one, at least not as far as the story is concerned. For once I am left uncertain about who the more likely candidate it. Which thrills me to no end, at the beginning of the story it seemed obvious who she would end up with, but by the end...I really hope the author does not take the obvious route. As usual, I love the atmosphere of the book more than anything. It was compelling and shiver-inducing. A cruel, post-apocalyptic world that is terrifying. Death is mundane and trust and hope nearly obsolete. However, even in this world there is the tiny sliver of light that makes the story compelling and real. I believe this light is found in Elise and Henry. They are adorable and bright children that I just love to pieces. There were a number of other aspects of the story I loved. Araby was a perfect narrator, and the first person style worked perfectly. I loved her relationships with her parents, April, and our two romantic interests (Elliot and Will) and how they progressed and how she grew. Prince Prospero and Reverend Malcontent were creepily awesome villains. The Debauchery Club fascinating as was world building with the porcelain masks and plague. Plus it is a brilliant reimagining of the Poe story which was fabulous! Overall the book was everything I could want, yet I still felt something was slightly off. I don't know what kept me from loving it as much as I want to, but there is something. I think it might be the cover, surprisingly. Regardless, I should love the book and I do to an extent and can't wait to read the sequel (because there is one!!!)! Characters were strong and unique. Love triangle was well done (for once!). World was atmospherically awesome!